1.) Start with 2 lines opposite one another and a ball between 2 larger cones. 2.) The lines must play one touch passes through the cones to the player opposite. 3.) Once the pass has been played the players must follow the smaller cones around the outside and back to the end of the line. 4.) 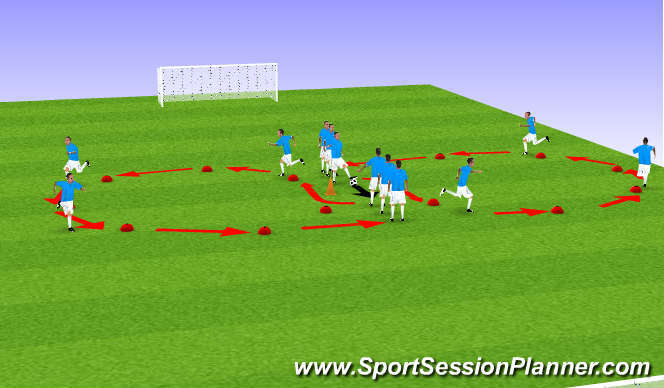 The players should move in different ways when going around the outside cones each time. For example: small skipps, high skips, alternate single knee dead lifts, over the gate (reversing half way round), side volleys, heel taps, alternate side steps, lunges, hamstring stretch, bounding etc. 7.) The ball is then played into area E where the player from &apos;Cone 6&apos; will make the run, receive the ball and then join the back of the line. The red lines indicate the movement of the players and which cone they should move to after playing the pass. 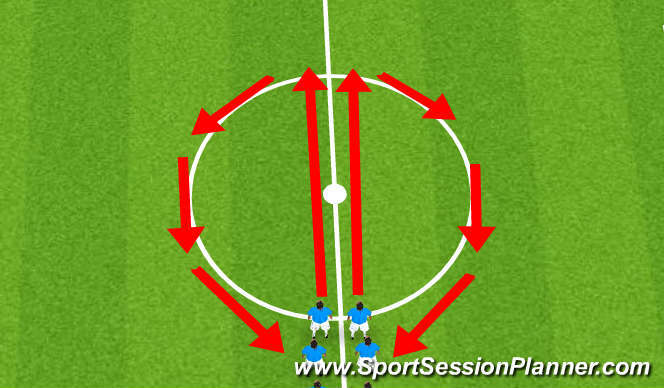 To progress this say that the player must play the ball first time (if they comfortable this) or even remove cones to make the players think about their positioning. 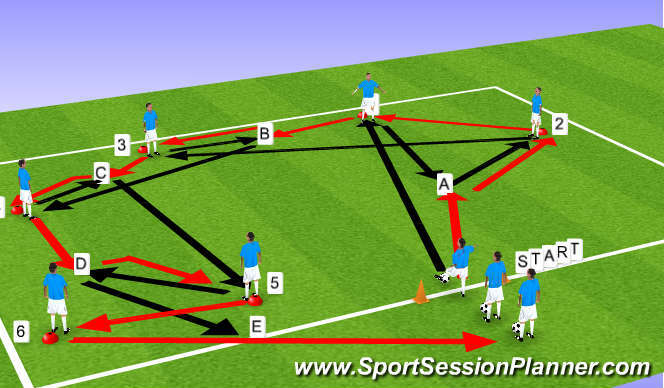 To progress even further ask the players to reverse the sequence and allow them to move the cones if necessary. 5.) To progress further once a team has scored a goal they cannot shoot in the same goal again. The aim is for one of the teams to score in all 4 goals to win. Finish the session off with an even sided game encouraging skills learned throughout the session to be used.